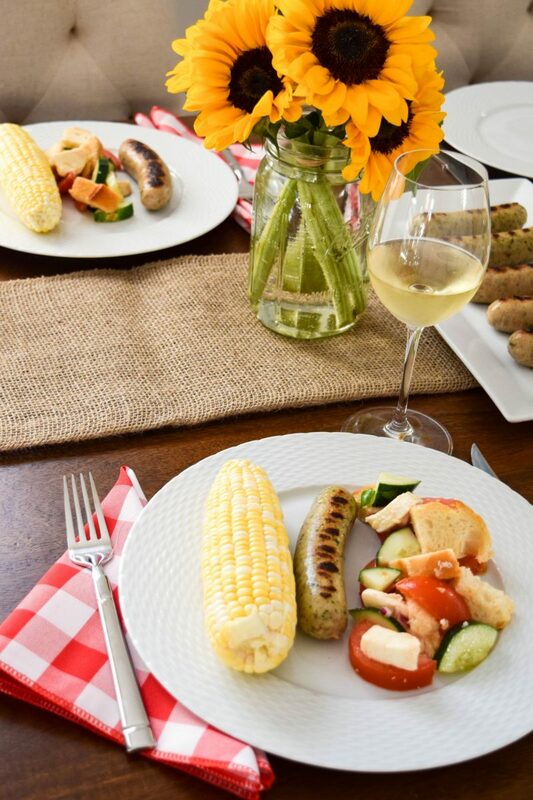 Who says you can’t host a summer soiree and barbecue when you live in the city? Sure, you probably don’t have any outdoor space or a grill, but that shouldn’t stop you! 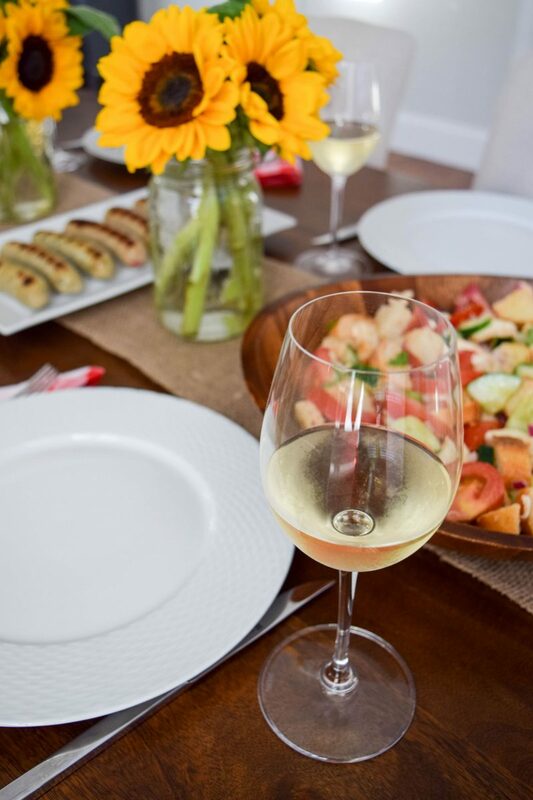 When my friends from al fresco natural reached out about partnering on a summer entertaining post, I have to admit I kind of thought the same thing. 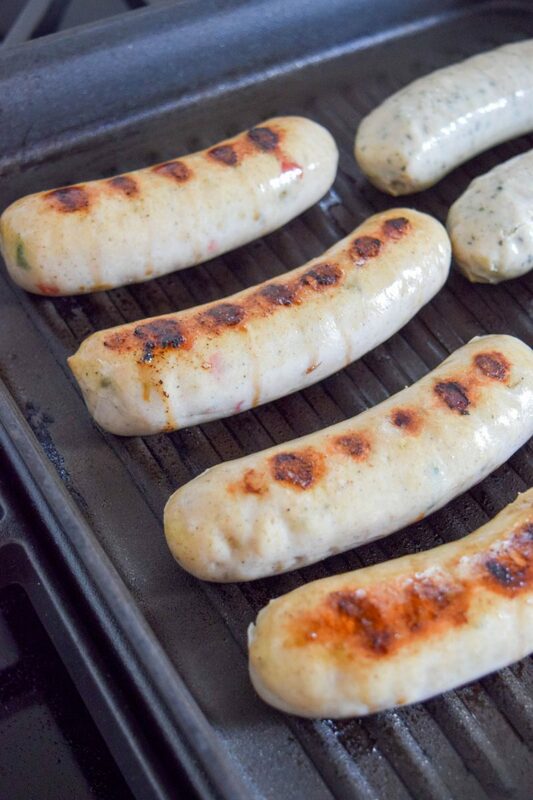 We don’t have a deck or yard, but we do have a trusty grill pan that I often use to grill my chicken sausages :). Boston Chic Party is all about celebrating the every day in our this great city we call home- and I’m not about to let city living stop my entertaining. And you shouldn’t either! al fresco natural is the best meat to serve for any summer barbecues- whether you are a city dweller or not! MJD and I probably eat their chicken sausages once a week. I love them SO much. 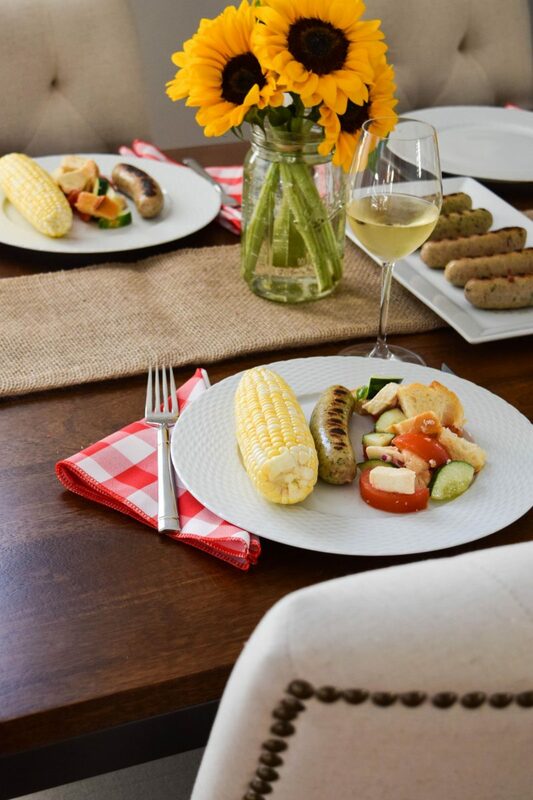 Not only do they have a variety of amazing flavors, but their chicken sausages are a healthier alternative to traditional sausage and can be prepared in a matter of minutes as they are already full cooked. The different flavors make it something you can have time and time again too! For a barbecue, I love that they make it easier to make chicken without dealing with raw meat while you have guests over. Their sausages are chicken- but better! 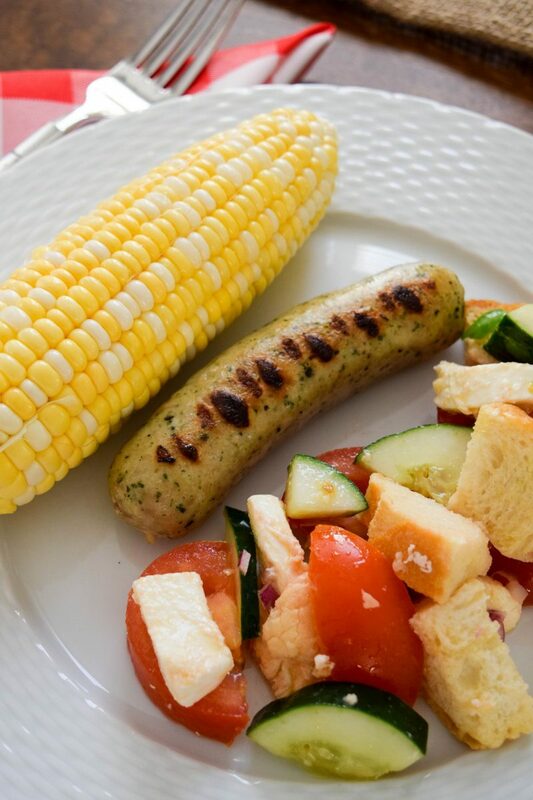 DO serve al fresco natural chicken sausages: These delish chicken sausages are the perfect main meat for your barbecue! They are fully cooked making them easy to handle (no raw chicken!) 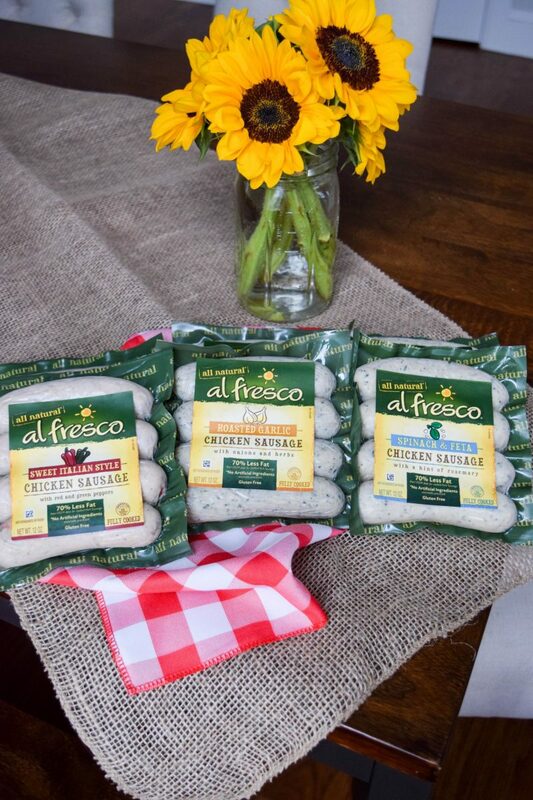 and they grill up in mere minutes allowing you to enjoy the party 🙂 al fresco’s sausages come in a pack of four so you can serve a few different flavor varieties as well. Your guests will absolutely love them all! My favorites for summer are the roasted garlic, sweet Italian and spinach & feta. 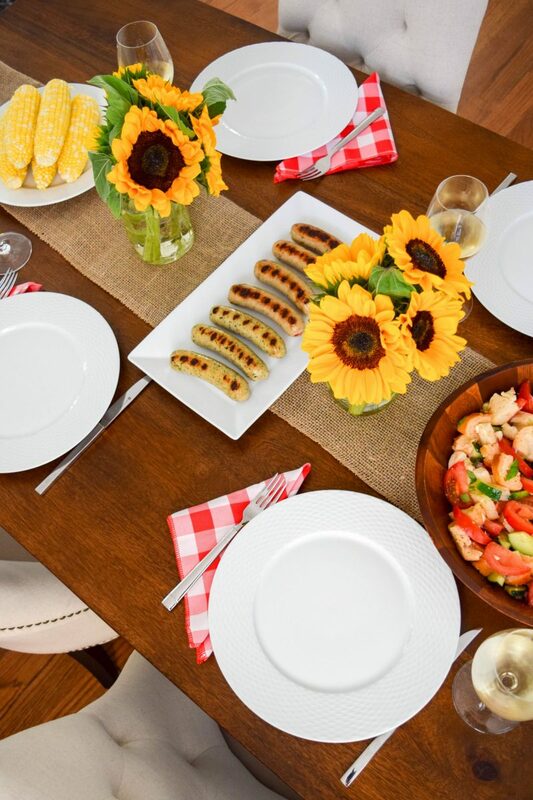 DO bring some traditional “barbecue” or summer inspired pieces into your table décor: I love a good tablescape, but one for a barbecue should definitely be fun and not fussy. This was easy to achieve with a bit of burlap, some picnic-table print napkins and sunflowers. I love the rustic, but classic look the burlap had when paired with the red-and-white check napkins. The print totally makes me think of barbecues and summer, but I think doing it in pops of print with the napkin is a bit more chic and city-like than a full tablecloth. 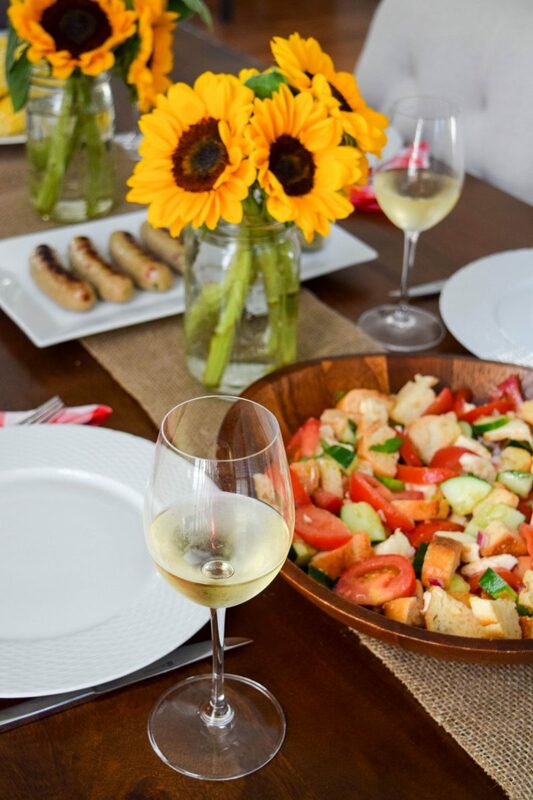 Can’t have a good tablescape without flowers and these pretty sunflowers were the ideal flower to bring it all together. 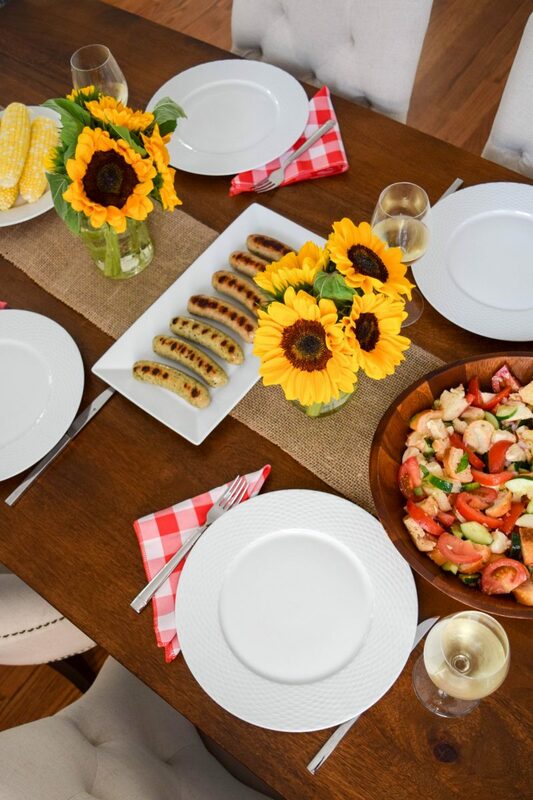 DON’T let a lack of outdoor space stop you from hosting a barbecue: Hopefully today’s post showed you that you don’t have to let traditional ideas of barbecues as outdoor events or your space (or lack thereof) stop you from throwing an amazing summer dinner party! In addition to making some of the yummiest products that I buy all the time, al fresco natural is a big supporter of the fight against breast cancer which is a cause near and dear to my heart. Being local to Boston, al fresco is a big supporter of the Ellie Fund and their services that aim to ease everyday life for breast cancer patients through meals, housekeeping and transportation amongst other things. This year al fresco will donate over 3,000 healthy meals to patients through the Ellie Fund. How amazing is that?! I was honored to be al fresco’s guest at the recent Five for Ellie fashion show to support the organization and learn more about the Ellie Fund. It made me love al fresco even more than I did before! What do you think- does my city style barbecue work? FYI- This post was sponsored by al fresco natural. All images and opinions are my own. Thanks so much for the sweet comment, D! xoxo! 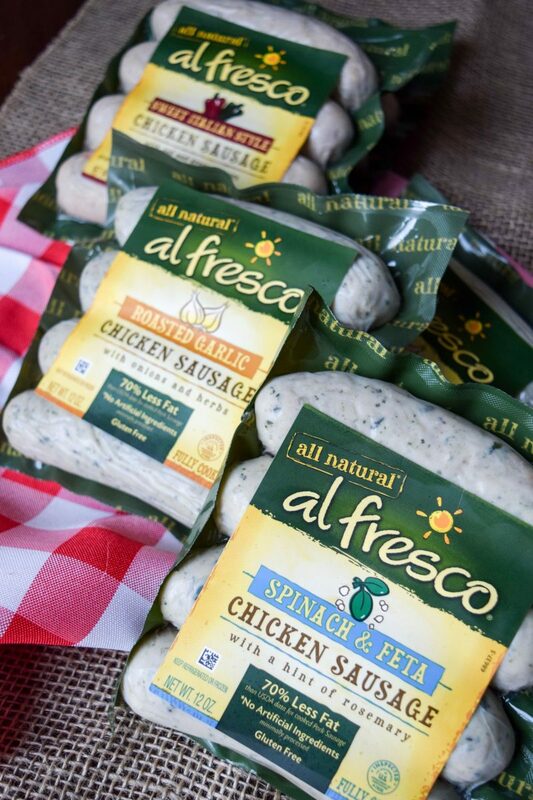 Looks great and I’m a big fan of Al Fresco – worked at Kayem on a contract and fell in love with all of their brands – who knew I’d like chicken sausage. Agree wholeheartedly on the grill pan – it really is a great investment and option if no outdoor grill. Great post as always Jenna – and I may have to try that salad. Second time I’ve seen a bread and tomato salad so you guys must be on to something! I love your festive 4th tablescape! So cute! And you can totally host a BBQ inside! We do it all the time! Thanks Jessica! Yes, its an awesome way to celebrate! xoxo! This is so fun! I love how decorated the table. The food looks amazing too girl! Those sausages are so good! Your set up turned out beautifully. This set up is perfect for a summer BBQ! How fun! This all looks so good! This post is making me so hungry!!! I always love throwing a fun BBQ over the 4th of July weekend!! What a gorgeous tablescape! 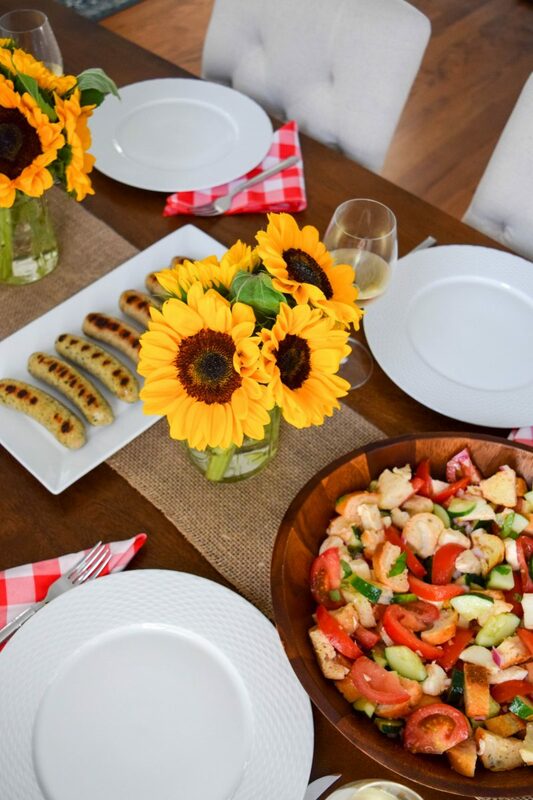 I love how you paired the red gingham with yellow sunflowers, it’s one of my favorite combos for events like this! Thanks Annie! I think it’s such a great color combo too! that chicken sausage is my all time fav! That bread salad looks and sounds delicious! Definitely adding it to my recipe list. Thanks Emily- yes, this one is chicken so it’s a great alternative! So many good tips! And now I’m hungry! Well this is adorable. I’ll have to take notes because we will be hosting a ton of parties at our new house. This looks like such a fun barbeque! I love your table setting as well! That food looks incredible! This is the perfect barbeque setup! Oh my gracious I really want to try that sausage now! Usually the alternative is turkey sausage, and I’m allergic to turkey, which is a bummer. I can try these out though! Your city barbecue tips are fantastic as well! Thanks Stephanie! Their sausages are fantastic! Chicken sausages are a favorite of mine. Your BBQ set up is perfection! That salad looks DELISH! And I love their sausages. SO yummy! Thanks Lindsey! I am a big fan as well! xoxo! GREAT tips! And I’m so happy to learn about this brand. 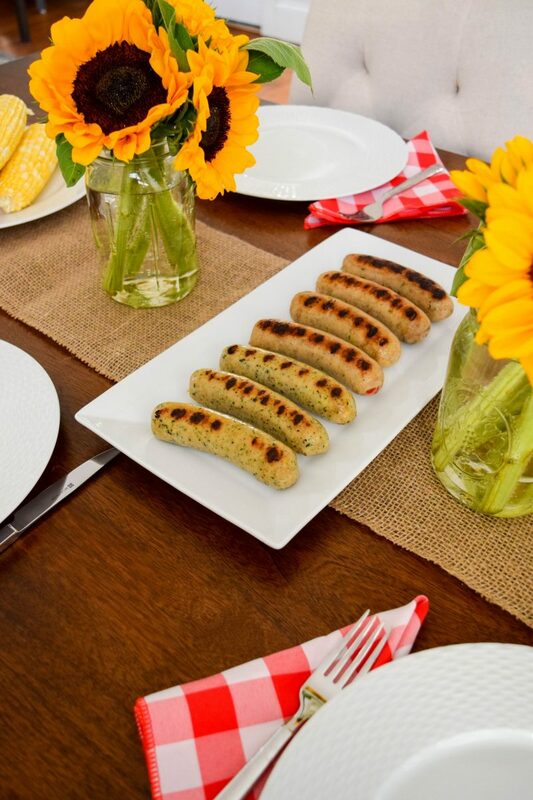 I am always looking for chicken sausage in place of regular sausage for recipes! Cheers! These are the best! Hope you can try them soon! Your pictures are beautiful! I love your set up – BBQs are so much fun! This is a struggle I’m definitely feeling this year!! I’m so craving home-grilled food this holiday, but all my friends are city dwellers without grills! I may need to invest in a grill pan. I think you’d love the grill pan! Let me know if you are able to use any of the tips 🙂 xoxo! Wow, that spread is so cute! Perfect for the holiday! These sound delicious and perfect for summer!! Love all the tips! Great post!